Salaka is a pattern from A Love Like Salt: North. The complete collection is currently available to order here, as either an e-book or paper copy+e-book. Sample shown (Medium) in Rusty Ferret Doll 4ply, in The Dark Below colour way. 8 sts x 12 rows = 1 “ / 2.5 cm in stocking stitch in the rnd. To fit foot circumference approx. 7.5 (8.5, 9.5) “ / 19 (21.5, 24) cm. 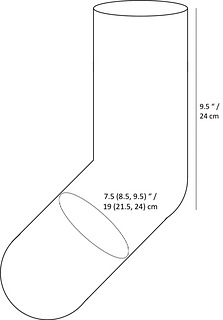 Leg length from cuff to base of heel flap approx. 9.5 “ / 24 cm.